A new lampworking friend, Eddy, challenged the theme of under the forest floor last night. I figured under the forest floor, there is surely a vein of gold, right? 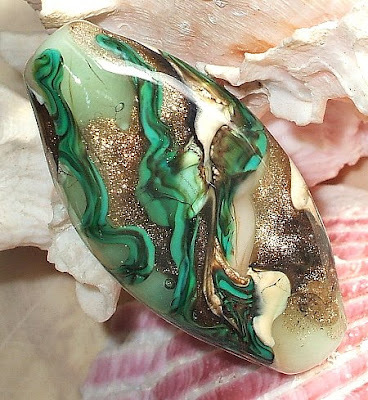 Yep, follow the next rainbow you see and you'll see this bead...stunning. Ok, so the gold stuff is waaaaaay cool. But I am lovin' that new green! !